Oh boy. The big shindig. 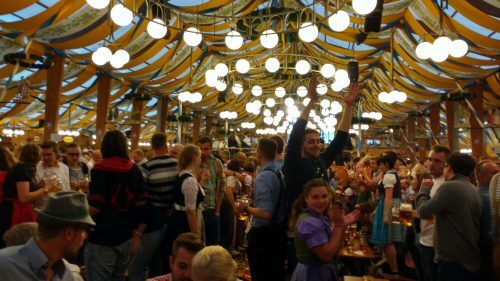 Munich’s Oktoberfest. It’s full of traditional beer, traditional clothing, and traditional food. 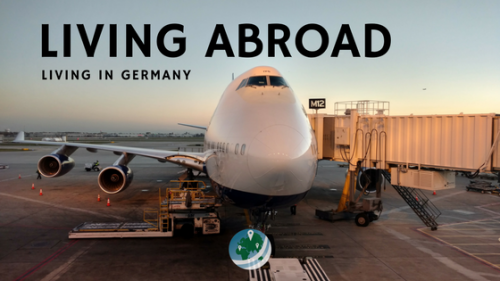 In addition to all this, it probably serves as the international image of Germany to the world. 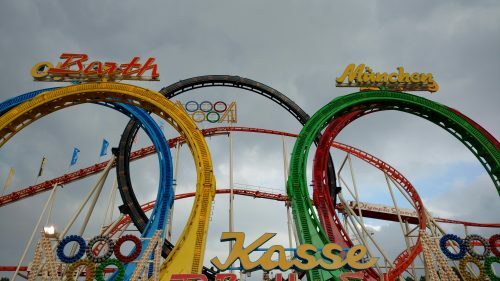 Besides faded memories of high school history, this festival is probably the reason most Americans even know of Munich. 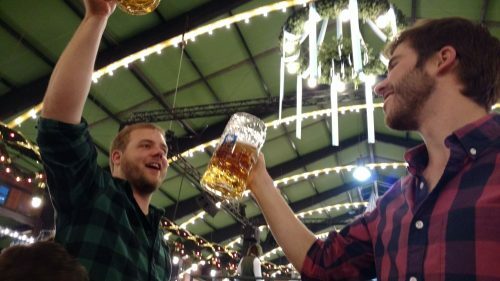 By this point, there is already so much written about Oktoberfest available to you online. I’m not sure that I can provide totally new ideas about the festival, but that’s not the reason I’m writing this. Unfortunately, there are a lot of misconceptions and exaggerated stereotypes about the festival. 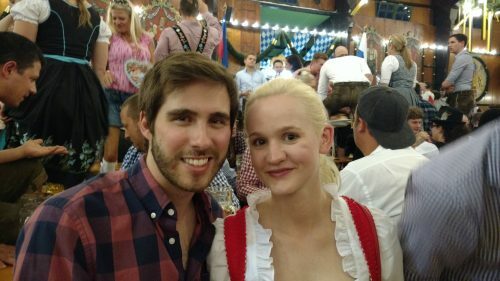 Oktoberfest 2016 just ended, making it my third year in a row of visiting the festival, and my second as a “local”. Maybe I can provide a more sober look at the world’s biggest folk festival. A friend inspecting the goods. Gotta make sure the beer is beer-y. Okay, maybe not entirely sober. But clear-headed, maybe? Here goes. 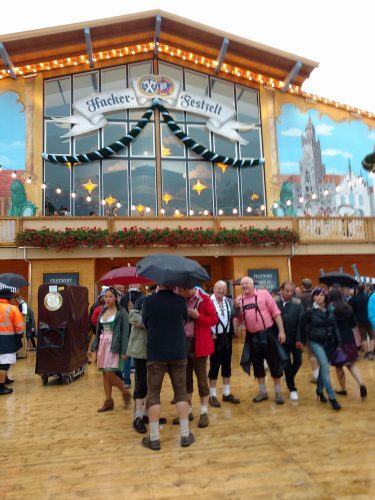 Oktoberfest, or “die Wiesen” (the meadow) as locals and veterans often refer to it, is actually an anniversary celebration of a wedding that took place in 1810. The wedding we’re all getting drunk for was the wedding of Crowned Prince Ludwig of Bavaria (later King Ludwig I, grandfather of the famous Mad King, Ludwig II of Bavaria) and Princess Therese of Saxe-Hildburghausen. The actual location of these horse races and the current festival is Theresienwiese. Over time, “Theresienwiese” transformed into the shortened name, “die Wiesen”. This wedding took place on October 12, 1810, and the origins of today’s Oktoberfest track back to its reception and the accompanying horse races. The choice to host horse races again in 1811 began to cement the tradition of a yearly fall festival into the city’s culture. Festivities expanded through the decades, adding rides such as swings and carousels, and beer stands which turned into the first beer tents in 1896. That’s enough history. Today, die Wiesen is the largest folk festival in the world. It averages about 6 million visitors a year drinking over 7 million liters of beer. As the festival grew, the city of Munich moved it up to begin in mid-September for better weather. Although the dates change every year, it runs for 16 days ending on the first Sunday in October. The festival is essentially one giant State Fair. 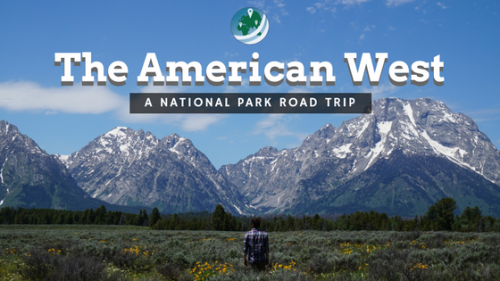 Take a look around, and you’ll see all the signs minus every type of fried food you could find in the US. 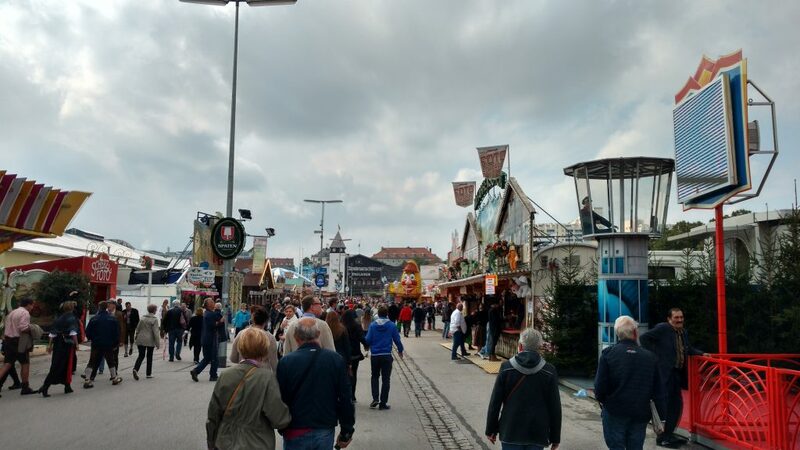 Your average “street” in Oktoberfest. Rides, shops, and food stands are everywhere. Only beer is inside the tents, though! At the festival, you’ll find food stands everywhere, souvenir kiosks, carnival rides, and of course, massive beer “tents”. Basically, it’s a giant State fair with more beer. It has all the signs of one, minus all that deep-fried food. The rides range from your typical carousels to 5-looped rollercoasters. 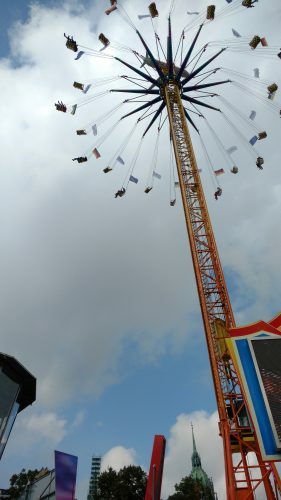 On the festival grounds, these rides essentially inhabit the larger southern part. On the north end is the street full of all the wonderful and extravagant beer tents. Speaking of these tents, there are 14 large tents and an array of smaller ones. The large ones are veritable monuments to the art of beer drinking. While they’re actually temporary structures, everything about them is large-scale. Some hold upwards of 10,000 people, though the average is probably around 6 to 7-thousand. 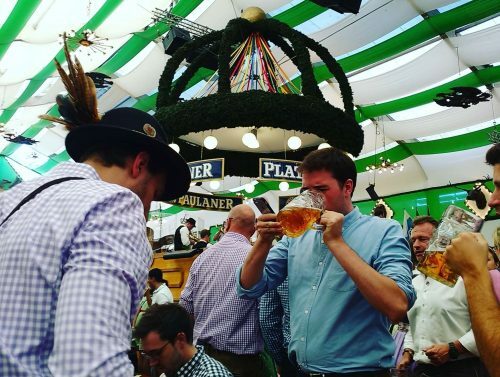 Inside the tents, you’ll find a wonderfully idyllic and traditional beer drinking atmosphere. Thousands of tables and benches sit inside a hall decorated with everything from wreaths of hops to extravagantly painted murals of the night sky. Each tent is pretty much the same as the next, however, each has its own vibe. 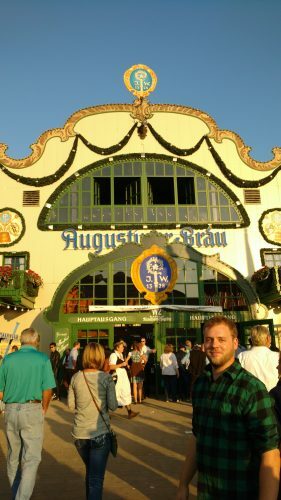 Augustiner has a higher percentage of locals, while Hofbräu has tons of tourists. This vibe exists in the tent’s music, too. Some tents play classic 70’s and 80’s after 6pm, while others may play modern pop and dance hits. 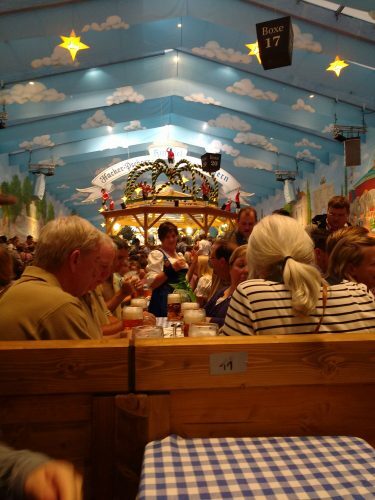 However, no matter the tent, you’ll hear the drinking call of Oktoberfest through the day and night – “Ein Prosit!”. By the end of the day, you’ll hopefully know the words or at least the melody – don’t worry and sing along! 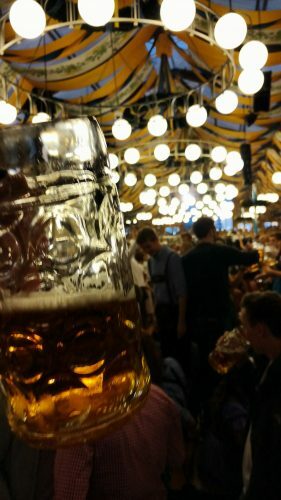 This pic was taken inside Hofbräu’s tent. Height and Light. These beer tents have at least two traits in common with Gothic cathedrals. No flying buttresses, though! 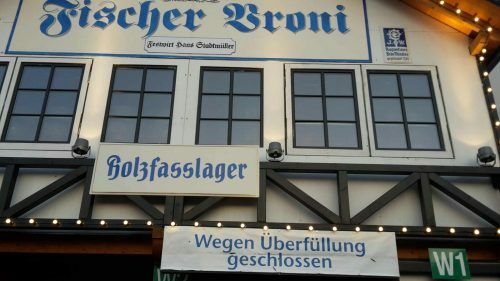 Each of the large tents belongs to one of the six major breweries of Munich: Augustinerbräu, Hacker-Pschorr-Bräu, Löwenbräu, Paulaner, Spatenbräu, and Hofbräu (the state of Bavaria’s own brewery). Speaking of the beer, you know that style of beer at craft breweries in the US called “Oktoberfest”? Yea, well, it’s nothing like actual Oktoberfest beer. The darker, somewhat spiced, and stronger American Oktoberfest beers only have one thing in common with the real thing: strength. 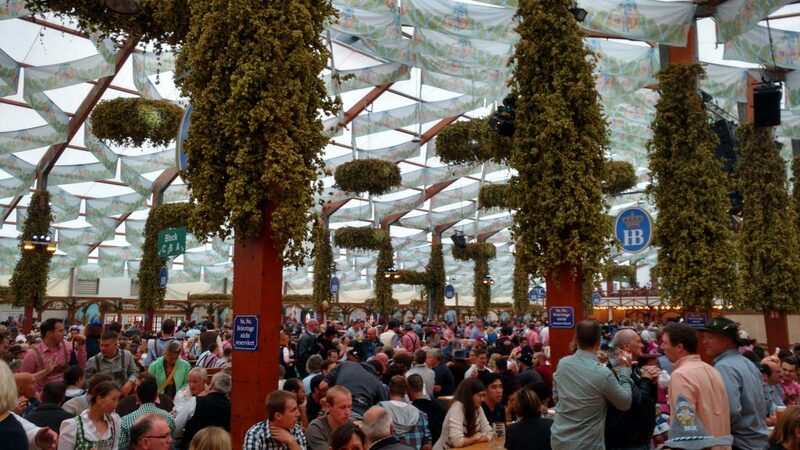 Beer at the actual Oktoberfest is much more similar to a traditional Bavarian Helles. Light, smooth, and easy to drink even though it’s a tad stronger than normal Helles. That extra strength is important because the only available size is “ein Maß”, pronounced “maas”, or one measure. That American-style Oktoberfest beer is pretty similar to the German Märzen style, brewed for spring festivals in March. I like it too, but it’s not Oktoberfest beer. 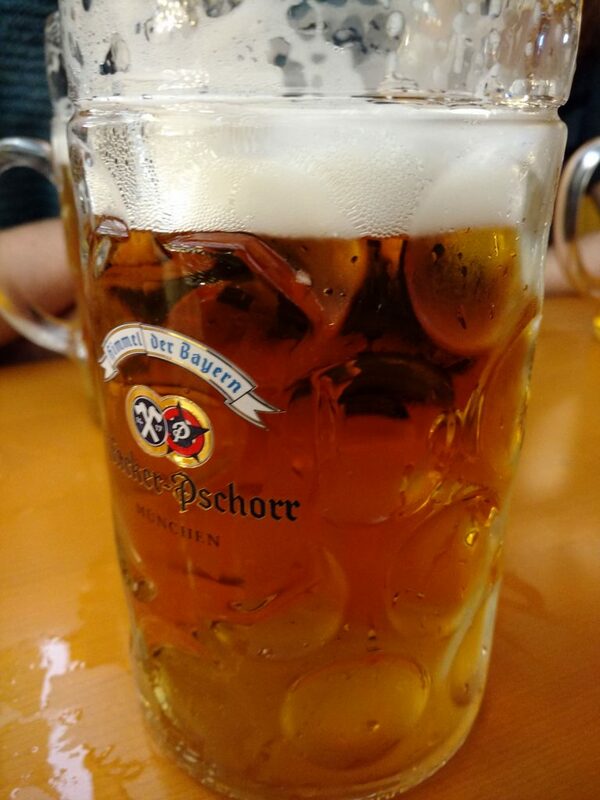 Yes, that’s right – the name for a beer at Oktoberfest means literally, a measure. So this means that the base unit of measurement for beers at the festival is the liter. That’s amazing, and that’s three times bigger than your puny 12 oz. beer. Another huge part of Oktoberfest is the food. At the festival, you’ll find every kind of typical Bavarian food with a focus festival-style food. From the crispy-crusted pork knuckle to the oven-roasted chickens, everything you’ll eat will be absolutely delicious. If any of you have read George R.R. Martin’s A Song of Ice and Fire, you’ll know he loves to go into detail about the festival and banquet food. It’s seriously like his descriptions, grease-dripping-down-your-chin delicious. You’ll also find the typical Bavarian pretzels: soft, oven-baked pretzels served with a dip called Obatzda. Obatzda is a spiced cheesy, creamy dip perfect for pairing with the soft pretzels. In the US, especially during these Oktoberfest-themed weeks at your local craft brewery, there’s often something called “beer cheese”. I have no idea where beer cheese came from, but it’s not Obatzda, and it’s never been anywhere near as good as Obatzda is with pretzels. Sure, beer and cheese are a great mix, I mean hell – take a look at Wisconsin. But, this dip isn’t German, and it’s not even that good in my opinion. You gotta come here to get the real stuff. Everyone thinks they can handle it. Everyone keeps thinking, “I only had three beers!”. 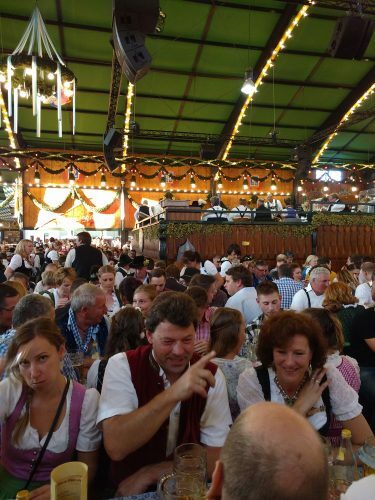 People always forget the axiomatic rule of Oktoberfest: One Maß, two Maß, three Maß…floor. Okay, it’s not always like that, and it depends on your speed of drinking, tolerance, and your intake of other things besides beer. My point still stands – be careful. 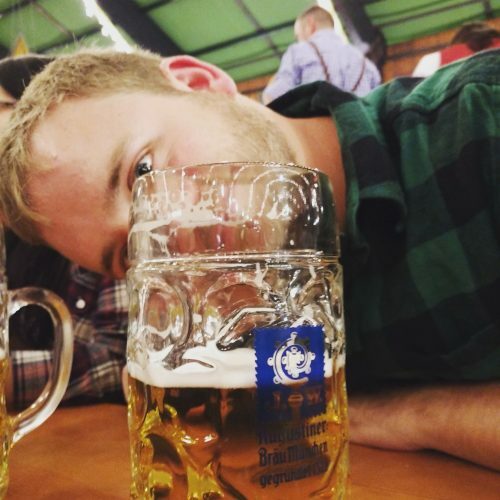 Oktoberfest beer is a magical potion capable of providing great fun but also great pain. Steady as she goes, it’s a marathon, not a sprint, and eat some food along the way. It’s no fun when you spend an hour looking for your lost friend because they got lost going to take a piss. So take it easy, especially if you’re visiting it a few different times. There’s plenty of beer to drink, don’t worry – they won’t run out. And finally, Prost! 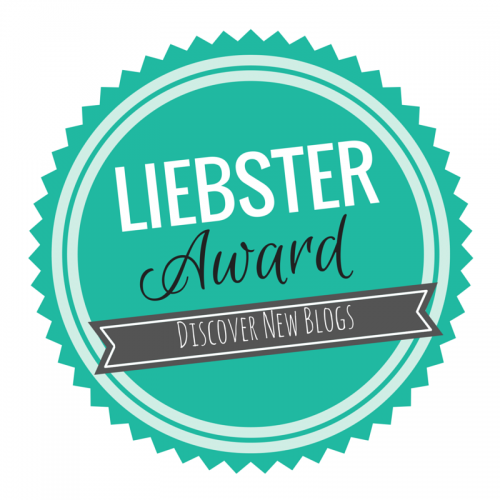 Cheers, readers! 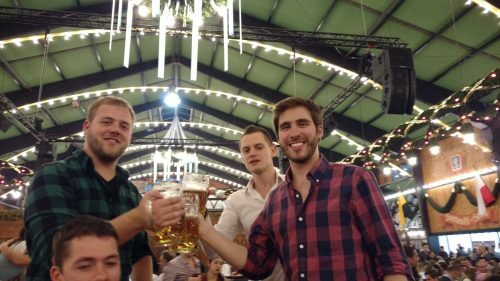 Thanks for reading – if you have thoughts or questions about all that, leave a comment below, or if you’ve been to Oktoberfest, please, share your experience (or what you remember from it) below! 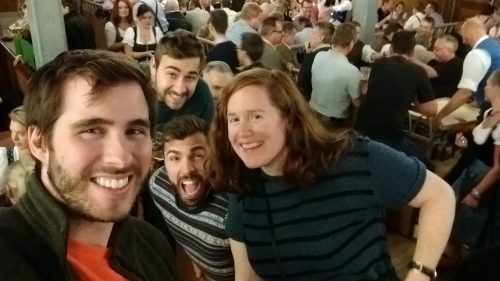 I love a good Oktoberfest story. P.S. 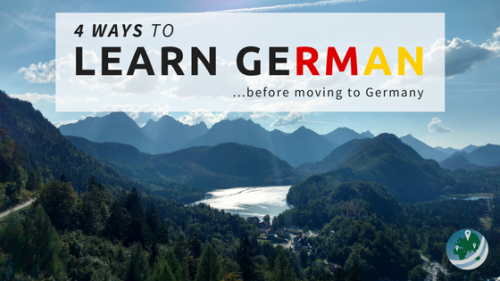 – Make sure you listen to the Germans when they tell you to look into each other’s eyes when clinking glasses for a “Prosit”. There’s a very good reason! 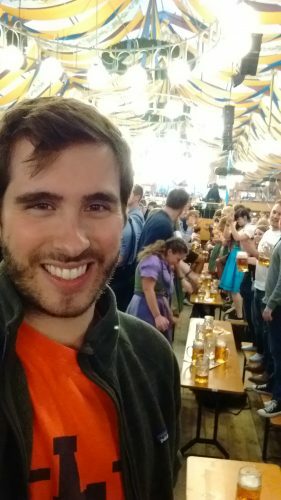 Enjoy a gallery of my photos below to get a better idea of what the festival is really like, and leave a comment if you have any questions about Oktoberfest! Oh. God. No. Why would I ride that thing after a couple of Maß? ARE YOU KIDDING ME? WHO IS RIDING THESE THINGS AFTER DRINKING? Oh wait, I did once. It was okay. There we go. Augustiner, my favorite beer made in Munich. One of my favorite tents too. NOOOO. Overfilled, therefore closed! boo. Early bird gets the worm, gotta get there early if you wanna get a spot in a tent! That’s more like it. Hacker-Pschorr is another great tent. Inside the tent! Let the party begin! After a selfie, of course. A different kind of struggle bus. Maybe this isn’t the time to go and start a conversation with this guy. I wouldn’t really be scared of him not being open to a conversation, but I’d be scared of him getting sick all over the place. Sometimes it’s best to let sleeping dogs lie. Things got a little insane that day. “It’s a marathon, not a sprint.” I’ll keep that in move!! Definitely a good mantra for any big festival event!